Got a hotel after fishing Diascund on Saturday and re-rigged my gear for saltwater. 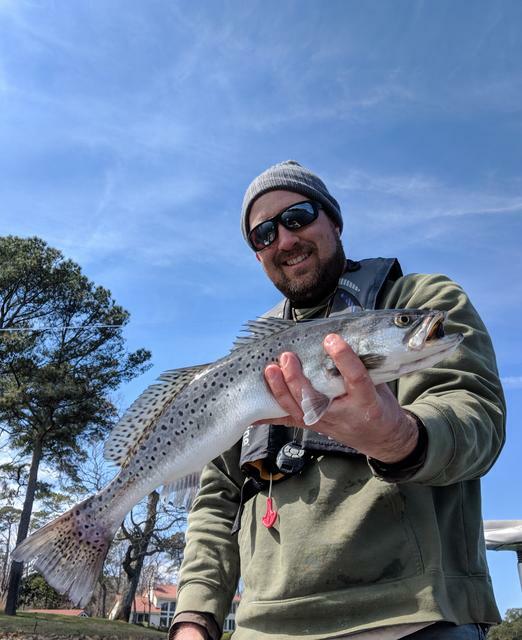 Sunday morning I headed down to Virginia Beach to see if I could get my first specks of the year. Launched at First Landing and fished backwaters all day, and found 30+ specks. Caught fish up to 19" but most were little 10-14" runts. All C&R. Swimmin super fluke was the hot lure but I got a few on a Mirrolure too. Water is up to 58 degrees in the shallows and the fish are aggressive. Nice! Always enjoy your reports!